If we diagnose TB early, we also prevent TB from spreading to others. Cutting TB transmission cycle can potentially turn the tide, said experts. WE ARE NOT DETECTING TB EARLY ENOUGH Where are we missing the defining pulse? Most likely we are not detecting TB early enough and mis-diagnosis and missed-diagnosis of TB are other challenges among many others that continue to puzzle us, said Dr Pawan Sharma, convener of the 'International Symposium on Tuberculosis Diagnostics: Innovating to make an impact' (ITBS 2010). 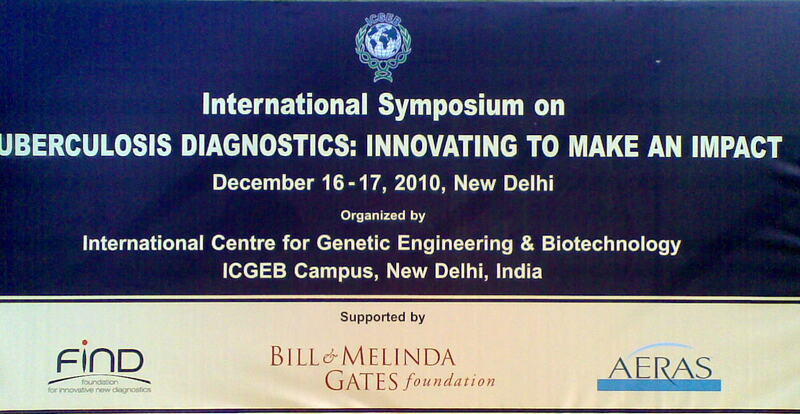 The ITBS 2010 is being organized by the International Centre for Genetic Engineering and Biotechnology (ICGEB) in New Delhi, India (16-17 December 2010) with support from the Aeras Global TB Vaccine Foundation, Bill and Melinda Gates Foundation and Foundation for Innovative New Diagnostics (FIND). "In roughly 55 years we have squandered our precious legacy of chemotherapy for TB…" said Dr William E Bishai from John Hopkins University. According to the World Health Organization, anti-TB drug resistance is a result of poor programme performance of DOTS – the WHO recommended strategy for treating TB. Patients with drug-resistant forms of TB – like multi-drug resistant TB (MDR-TB) or extensively drug-resistant TB (XDR-TB) have severely limited treatment options, or at times with XDR-TB, there is virtually no option left for treatment. For patients with XDR-TB that have no treatment option left it is like going back to the pre-antibiotic era before 1940s where TB was not treatable. "How did we get into this mess?" asked Dr William Bishai. Lack of prevention (vaccines), lack of treatment, lack of diagnostics and biomarkers and lack of appreciation of complexity were key reasons listed by Dr Bishai for the difficult challenge TB poses today. "Microscope remains the fundamental diagnostic tool since 1882 when Dr Robert Koch invented it" said a representative of Foundation for Innovative New Diagnostics (FIND). In a study done in India, it was found that the direct costs incurred on TB diagnosis and treatment were just 1/5 of the total costs a patient incurs during TB therapy (direct cost: 0.5 billion, indirect costs: 2.5 billion). A lot of these costs a patient incurs happen before he or she gets to the proper TB clinic – and a significant amount of time is also lost as well, at times spanning months and years till proper therapy begins. Also in terms of spreading TB infection, it is very important to diagnose TB as early as possible to cut transmission cycle. The DOTS expansion has not resulted in better case detection rates (case detection has more or less remained steady) – despite of rapid expansion of DOTS - so we need to do more than implementing DOTS, said the FIND representative. In a study done by Dr Girzybowski, it was found that if any of the parents have smear-negative TB, children were found to have the same chance to get infected with TB as someone in the community (which is much lower), however if the parent had smear positive TB, then at least 35% chance exist of the children to get infected with TB. No doubt, there is a strategic need for early diagnosis of TB, and sensitivity and speed of the diagnostic tools are keys to cut the transmission cycle, said FIND representative. Another good example comes from Peru where Peruvian TB control programme is doing all what is possible to do in that scenario. TB rates in Peru dropped phenomenally in early years but since past 5 years, the rates have more or less remained same. Probably the need to diagnose TB early in those who are currently either being missed or those who get diagnosed very late is crucial and compelling. Just last week, the WHO endorsed a new and novel rapid test for TB, especially relevant in countries most affected by the disease. The test could revolutionize TB care and control by providing an accurate diagnosis for many patients in about 100 minutes, compared to current tests that can take up to three months to have results. "This new test represents a major milestone for global TB diagnosis and care. It also represents new hope for the millions of people who are at the highest risk of TB and drug-resistant disease." said Dr Mario Raviglione, Director of WHO's Stop TB Department. "We have the scientific evidence, we have defined the policy, and now we aim to support implementation for impact in countries." WHO's endorsement of the rapid test, which is a fully automated NAAT (nucleic acid amplification test) follows 18 months of rigorous assessment of its field effectiveness in the early diagnosis of TB, as well as multidrug-resistant TB (MDR-TB) and TB complicated by HIV infection, which are more difficult to diagnose. Evidence to date indicates that implementation of this test could result in a three-fold increase in the diagnosis of patients with drug-resistant TB and a doubling in the number of HIV-associated TB cases diagnosed in areas with high rates of TB and HIV.